As an analyst at Spinverse, Andreas works in the areas of Bioeconomy, Circular Economy and Renewable Energy supporting customers in a wide range of different projects. 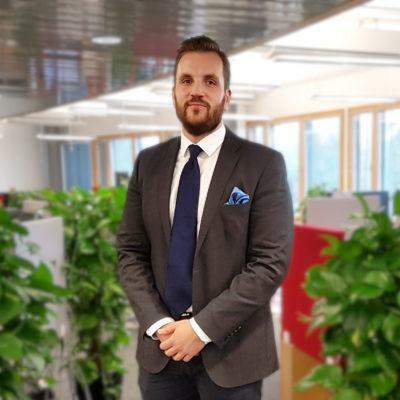 Prior to joining Spinverse, he gained industrial experience as a development engineer at CP Kelco (Äänekoski, Finland) working with a vast range of projects related to the manufacturing and end-user applications of carboxymethyl cellulose. In addition, Andreas has gained academic experience as a researcher and a principal tutor of the CHEMARTS program at Aalto University (Espoo, Finland). Andreas has graduated from Aalto University’s Department of Forest Products Technology with a M.Sc. (Tech.) degree in paper technology. Prior to his university studies in Aalto University, Andreas graduated from École Européenne de Bruxelles II (Brussels, Belgium) with the European Baccalaureate (EB) degree. In his spare time Andreas enjoys taking long walks with his poodle Esko around Töölö Bay and collecting rare vintage vinyl records from all over the world.